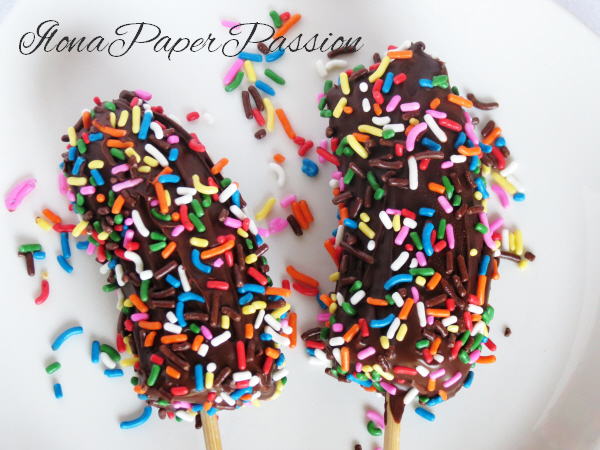 This Chocolate Banana recipe can be found everywhere on the internet, but I had to make and share it.. because it is PERFECT FOR A PARTY! Do you agree? I think it is a hit, children will love it! My younger son helped me and he could not wait to eat it. I was a little scared how the chocolate will spread on the bananas, but it is not difficult. Peel bananas and cut in half. Put wooden stick into each banana. Put it on parchment paper and leave it in the freezer for half an hour. Melt chocolate chips in the microwave or use double boiler method (fill lower pan with water, bring water to simmer, take off from heat, put chocolate chips in top pan and stir). On the end put sunflower oil to the melted chocolate chips, it will be easier to spread. Take out bananas from the freezer and spread chocolate evenly on each of them. Sprinkle right away. Put bananas back to the freezer for couple hours or if you prefer a softer version; half an hour will be enough.